Members of TeamCeline will have access to purchase tickets before the public through an advance pre-sale on February 13 from 10:00 AM to midnight. PLDT Smart subscribers will also have their special pre-sale on February 14 from 10:00 AM to midnight. Tickets will be available to the public on February 15 at 10:00 AM. The tour is produced by AEG Presents and co-produced in Manila by Ovation Productions. Sponsored by PLDT Smart. One of the most immediately recognized, widely respected and successful performers in pop music history, Celine Dion has sold almost 250 million albums during her over 30-year career. She has earned five Grammy Awards, two Academy Awards and seven American Music Awards. In 2004, Celine received the Diamond award at the World Music Awards recognizing her status as the best-selling female artist of all time. In 2016, the Billboard Music Awards presented her with the lifetime achievement Icon Award. Celine continues to break records with her ongoing Las Vegas residency at The Colosseum at Caesars Palace which has played over 1,000 shows to more than four million fans. 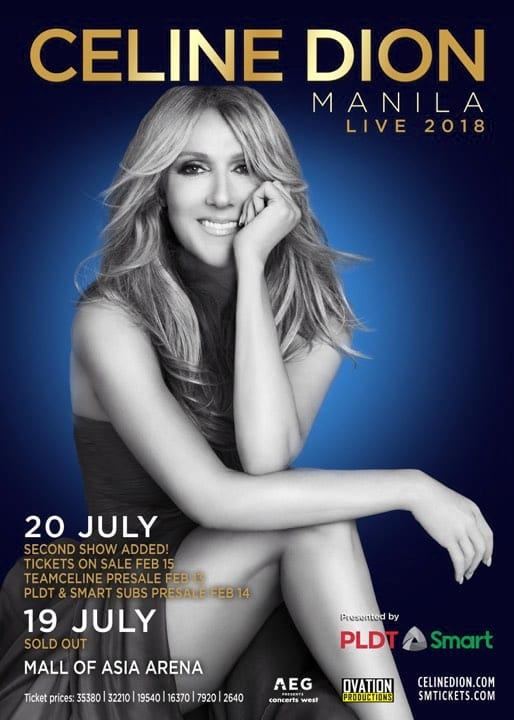 CELINE DION LIVE 2018 in Manila on July 19 & 20 at the MOA Arena is produced by AEG Presents and Ovation Productions and sponsored by PLDT Smart. Ticket prices: P35380, 32210, 19540, 16370, 7920, 2640. Tickets available through www.smtickets.com or call +632-470-2222.